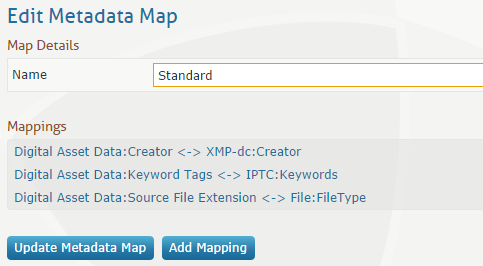 By using embedded metadata mapping, selected metadata embedded in an image can be copied automatically during upload into specified Trinity metadata fields. As delivered Trinity has a standard metadata map. The screen shot below shows that the standard metadata map is set to copy embedded metadata from an image to specified fields in Trinity, i.e. The ‘XMP-dc:Creator’ tag is copied to the Trinity field ‘Creator’. 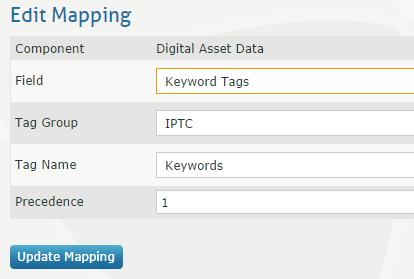 The ‘IPTC:Keywords’ tag is copied to the Trinity field ‘Keyword Tags’. The ‘File:File Type’ tag is copied to the Trinity field ‘Source File Extension’. Component - the component type being mapped. Field - the field that embedded metadata will be copied to. Tag Group - the embedded metadata group from which a tag name will be selected. Tag Name - the embedded tag from which data will be copied. Precedence - if two source tags are mapped to one Trinity field, setting 1 here checks this tag first for valid data. If it doesn’t have valid data the other field will then be checked. To add a new mapping to the map, click ‘Add Mapping’ and edit the details as above. Administration / Metadata Maps page. Click Add Metadata Map and enter a name for the map. Click Update Metadata Map, then edit the map as above. Click Delete on the map to delete.